Believe it or not, selecting the best pair of mountain bike shoes is about more than opting for the ones that look the best. Instead, you need to consider a range of different criteria that all play a part in the decision-making process. The pair of shoes that looks the most attractive can often be the one that won’t meet your needs at all. 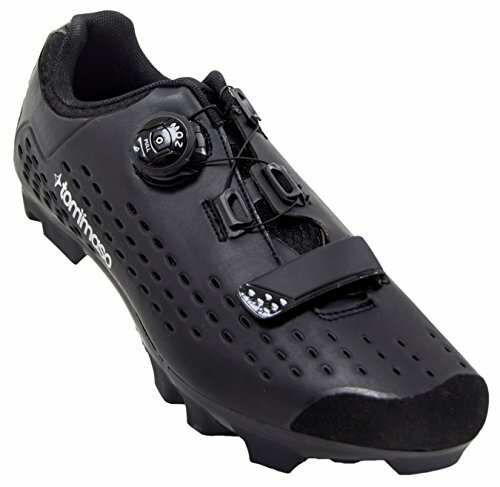 Firstly, you need to decide whether you need clipless or flat pedal mountain bike shoes. Flat pedal shoes have a flat sole, the rubber is stickier than a typical tennis shoe, and there is more contact with the pedal than any other type of shoe. Clipless shoes, on the other hand, have stiff soles, an area to mount the pedal’s cleat to, and usually use a nylon shank. The fit is also essential. When you buy new mountain bike shoes, you need to make sure they’re comfortable. Any seam rubbing, uncomfortable tightness or irritation you will find to be amplified when you get on your bike. Finally, the price matters too. It’s crucial to get a balance between price and quality, such as what these nine products below offer. If you’re looking for mountain bike shoes that are stylish, affordable, and functional, these tick all those boxes. Even though they are suitable for riding your bike, you will also find the versatility on offer quite impressive. You can wear them for everyday use, benefit from the exceptional comfort and fit when you’re riding your bike, then wear them for various other sports as well. They are suitable for many uses while looking stylish with any outfit. 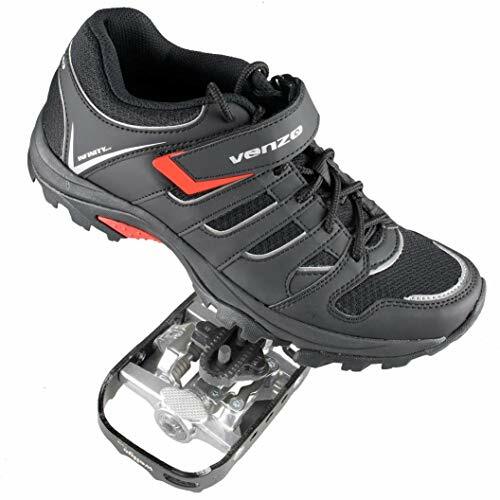 The heel of these mountain bike shoes is also low at one inch, giving you better balance on your pedals, while the platform is also one inch. What many people also like about these shoes are the quality materials. The exterior shell of the boot features leather which will last the distance, while the soles are a sticky rubber for better grip. You will find that when you buy these shoes, the durability and grip on offer is exceptional. When you want professional mountain bike shoes, it’s helpful to opt for a brand that people know for its quality. Therefore, when you buy these Venzo shoes, you will be more than impressed with what they offer. With award-winning technology, an excellent price tag and unparalleled comfort, they tick all the boxes before you even put them on. However, as soon as you start wearing them, you’ll know they are the right shoe for you. The lining consists of textile fabric with a removable sock liner for hygiene, while the synthetic fabric and mesh combination helps to create a more breathable shoe. As a result, when you’re riding for extended periods, you can benefit from decent ventilation as well as a quick-drying feature as well. The cut of these shoes is also a noteworthy feature. Because they are low cut, they are easy to put on, feel fast, and are very lightweight as well. What’s more, the forefoot is flexible while the heel features beveling. They weigh only 640 grams and are a size 44 shoe, so there’s every reason to believe these lightweight mountain bike shoes are the answer to your problems. Not everyone wants to spend a fortune on mountain bike shoes – particularly when you often can’t use them for various cycling types. 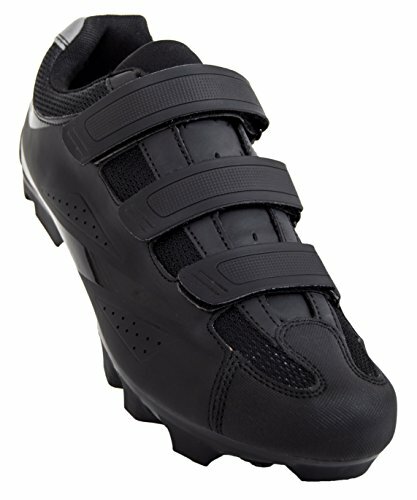 These shoes, however, are affordable to suit more people, while being versatile for a range of cycling types. You can use them for indoor cycling, touring, and mountain biking. Therefore, you can buy one pair for three events, rather than three pairs. What stands out the most about these shoes is the overall styling. They feature a reinforced toe and heel cup so that they’ll last longer, while also offering a rubber outsole with exceptional grip. They then have a nylon mid-sole with fiberglass reinforcement. As a result, you can benefit from far better pedaling efficiency than several other mountain bike shoes on the market. They feature comfortable suede material, are an attractive color combination, and the upper component is a breathable mesh fabric. Sealing the deal is the knowledge they are SPD compatible, working excellent with platform pedals as well. With quality and a precise fit as well as a competitive price tag, there’s every reason to believe these mountain bike shoes will suit your needs to a tee. Tommaso is offering these shoes at an unbelievable price while ensuring you receive all the features you know and love of leading mountain bike shoe brands. The first of many noteworthy features is the comfort. Because they feature synthetic leather, you benefit from feeling like your feet are getting hugs. However, those hugs are breathable as there is also plenty of mesh to help with ventilation and keeping your feet fresh. The benefits don’t end there, either. Because these mountain bike shoes have a sole with fiberglass reinforcing, you benefit from increased power than ever before. There is a perfect balance between power transfer and stiffness which helps you to ride faster for longer while not using more energy to do so. 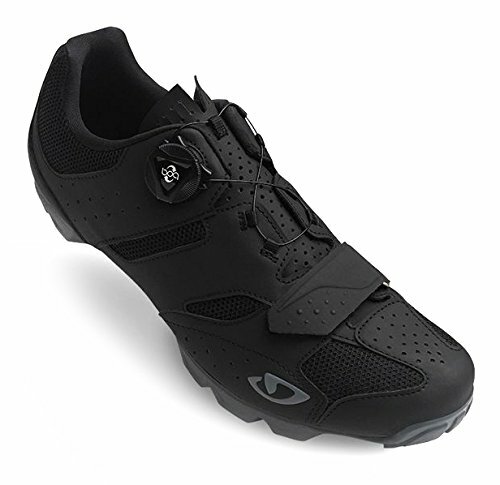 They are also a very versatile shoe, being suitable for mountain biking, touring, commuting, spinning, and more. In fact, if it involves cycling, you will find this shoe will almost always be suitable. They come with a two-year warranty, are exceptionally comfortable and durable to last the distance, and even their design is stylish. When you’re ready to buy new mountain bike shoes, add these to the top of your list. 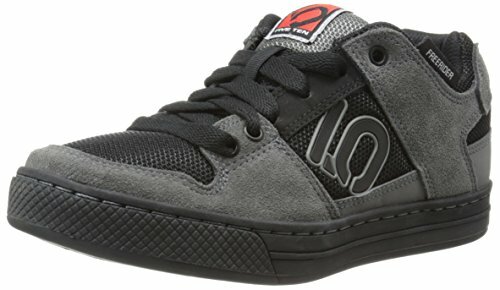 Rather than opt for mountain bike shoes that you can’t use for anything else, why not go for these from Five Ten that are versatile and user-friendly? While they are more than suitable for going cycling, you can also wear them around the streets while benefiting from that “cool” skaters look. They feature suede leather for better comfort, durability, and style while being easy to keep clean as well. What’s more, you can select from several sizes to ensure they fit perfectly. What people love the most about these shoes, however, is the comfort. They feature an EVA midsole which provides better support, but it also absorbs shock as well. Therefore, you barely feel any sudden pressure underfoot. They also feature rubber dots on the tread for friction and grip, while adding an element of cushioning at the same time. Stylish, sleek, affordable and built to last, you will love everything these mountain bike shoes have to offer. If you want to get serious about mountain biking, you need to get serious about mountain bike shoes. While regular footwear is okay for casual bike rides, they are not ideal for competitive cycling. They don’t provide the support you need, while they often aren’t grippy, breathable, or in any way suitable for your needs. These mountain bike shoes from Tommaso, however, will prove their worth in no time. The upper parts of them feature high-quality microfiber with nylon mesh inserts, and the results are unbelievable. The combination of these two fabrics enables you to benefit from extreme comfort as well as breathability. As a result, you never feel like your feet are sweaty, hot, or uncomfortable. To add to the comfort is the EVA insole which molds to your foot. This insole is also easy to remove while being entirely breathable as well. 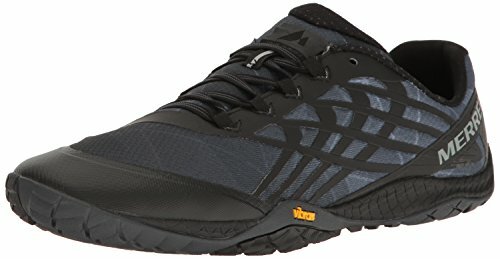 If you want mountain bike shoes that will improve your performance and power, you could do a lot worse than these shoes. With a cleat plate featuring carbon fiber, you benefit from far better power transfer than regular shoes, as well as more efficient strokes on the pedals. 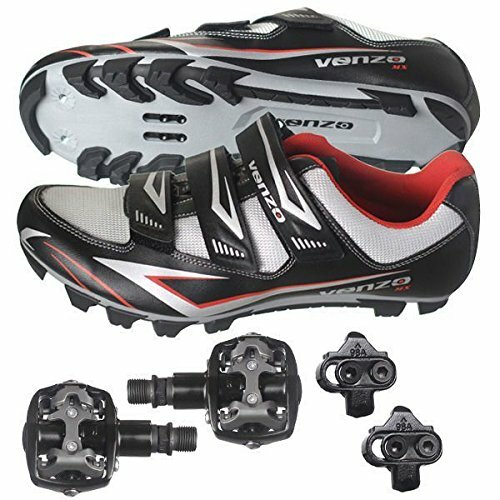 Whether you’re mountain biking, commuting, spinning, or touring, you will love how these mountain bike shoes feel on your feet in contact with your bike pedals. If you’re finding it difficult to find quality mountain bike shoes that both look the part and help your cycling performance, take a closer look at these shoes from Giro Republic. While they’re seamless in design, they tick all the boxes for your on-road riding requirements. They feature leather, micro-suede, and micro-fiber material, all which work together for a more comfortable and high-performance shoe. The micro-suede works well to provide comfort in the top sheet of the shoe while aligning nicely with the arch support and EVA footbed as well. 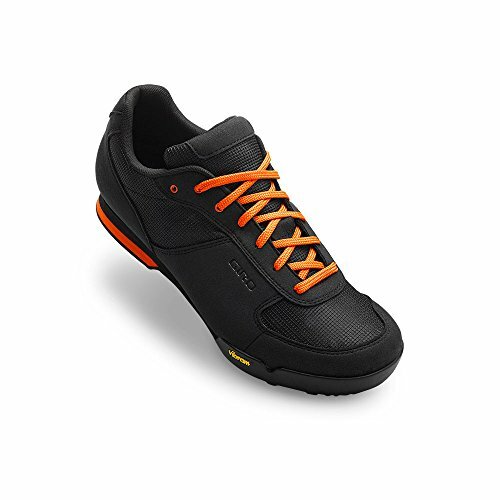 The microfiber upper component, on the other hand, features perforation for better breathability than many other mountain bike shoes on the market. The benefits don’t end there. These shoes are also affordable, come with non-slip laces, and are very lightweight at only 315 grams. You will struggle to find another pair of shoes with as many convenient features as these. Most of the mountain bike shoes you will find on the market are very calm in their color palette. Sometimes, you want to stand out from the crowd, but the current shoe selection doesn’t allow it. These mountain bike shoes from Sidi, on the other hand, actively encourage you to let out your inner vibrancy. You can choose from a range of vibrant color combinations such as red and yellow, or you can opt for something a little tamer such as matte black. Whatever color you choose, you will find it looks striking against the colors of your bike. However, there is more to these mountain bike shoes than standout colors. You will be impressed with the range of features these shoes have. 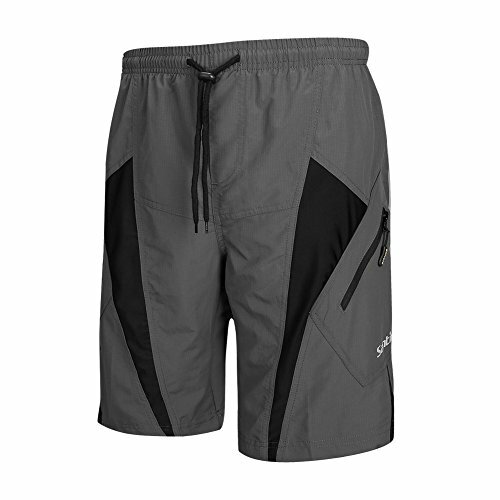 The upper material is ballistic mesh for breathability and microfiber for comfort and ease of care. Such a combination allows you to get the most life out of these shoes. What’s more, they come with a carbon ground sole and excellent cleat compatibility. As a result, you will find most pedal types will work well with these shoes. They are affordable to buy, comfortable to wear, and they will suit all your mountain biking requirements with ease. There are hundreds of varieties of mountain bike shoes on the market, but you are sure to find the majority are low cut. While there is nothing wrong with low cut shoes, not everyone is going to use their mountain bikes only in warmer weather. If you like to ride in all weather conditions, mountain bike shoes with ankle coverage are going to be a better option for your needs. These shoes are a standout on the market for many reasons. They keep your feet warm, feature synthetic leather and waxed canvas for rain proofing, and even feature a very aggressive sole for better traction in winter when you’re walking. What’s more, they have a nylon platform which remains stiff for better performance and power while pedaling.